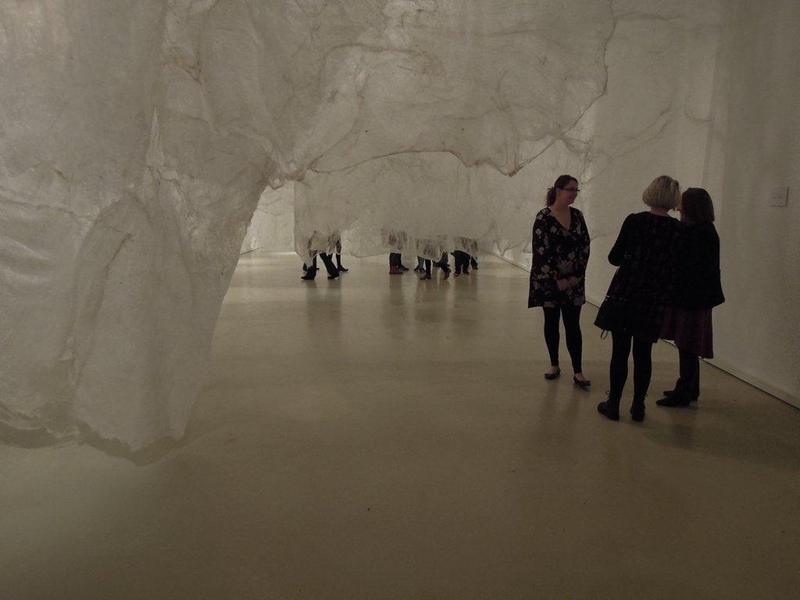 The single work Blood on Silk: Farnham uses layers of handmade silk paper both to define the structure of the gallery space and to partially conceal it. Working as a semi permeable membrane some things are allowed to pass and others held. The silk paper is beautiful, isolating and with its references to connective tissues and funeral shrouds, forlorn, invoking the ideas and experiences of absence. Blood on Silk is a three way collaborative project of ideas between Dr Peter Domachuk, a physicist at the University of Sydney, Dr Lee-Anne Hall a writer and Fiona Davies a visual artist. Following the death of Davies’ father in 2001 she has worked with ideas of medicalised death and particularly the domestication of the daily ritual of taking blood samples in intensive care. Dr Domachuk’s research is the development of implantable silk microchips which would provide a platform within the blood stream allowing the properties of blood to be read or determined in real time while the blood is still within the body – a biophotonic chip.